Five years ago if the boat brands Tiara, Cobalt, MJM, Formula and Regal were mentioned in the same sentence it would have been easy to assume the conversation was headed toward a discussion of luxury boats powered by inboards or sterndrives. Today each of these companies has embraced a trend that has taken over the recreational boating industry — dayboats with outboard power. The entire Tiara Sport LS series will have Yamaha outboard power, and the new 37 Tiara Sport LS will be powered by triple 300-hp engines. Glenn says the new line is a natural expansion for a company that has decades of experience with outboards through its Pursuit line of fishing boats. After the introduction of the company’s Coupe series of dayboats a couple of years ago, Tiara got feedback from customers who liked the concept but wanted more performance. One of the big reasons Malibu Boats executives gave for the recent purchase of Cobalt Boats is to gain a better presence in the outboard-powered boat market. Long known for its diesel- and gasoline powered sterndrives, inboards and pods, Volvo Penta just bought high-performance outboard manufacturer Seven Marine, which builds 557-hp and 627-hp outboards based on a General Motors LS V-8 block. Heck, there are Ranger Tugs running around with an outboard clamped to the stern. The new MJM 35z combines the comfort and luxury the manufacturer is known for with the enhanced versatility and performance that come with twin outboards. Zurn designed the 35z and the 43z, so Johnstone is expecting similar performance and handling traits to the 29z. Whatever the reason, the numbers are undeniable. According to information gathered by Ryan Kloppe at Statistical Surveys during the three-year period from 2014 to 2016, outboard sales increased by about 9 percent — from 146,762 units in 2014 to 158,938 in 2015 and 166,078 in 2016. Inboard sales during those three years peaked at 76,489 in 2016, and sterndrive sales were actually at their highest, 13,894, in 2014. In its 2017 earnings report, Mercury parent Brunswick said outboard sales were up in the first quarter, “particularly in high-horsepower categories,” but provided no additional details. Evinrude’s E-TEC G2 200 is part of the manufacturer’s line of 2-stroke outboards that ranges from 150 to 300 hp. Another sign that the power levels are increasing is that in 2008 the average horsepower in the United States for all outboards was 80. In 2017 the average is 105, and Caruana says that number is growing. 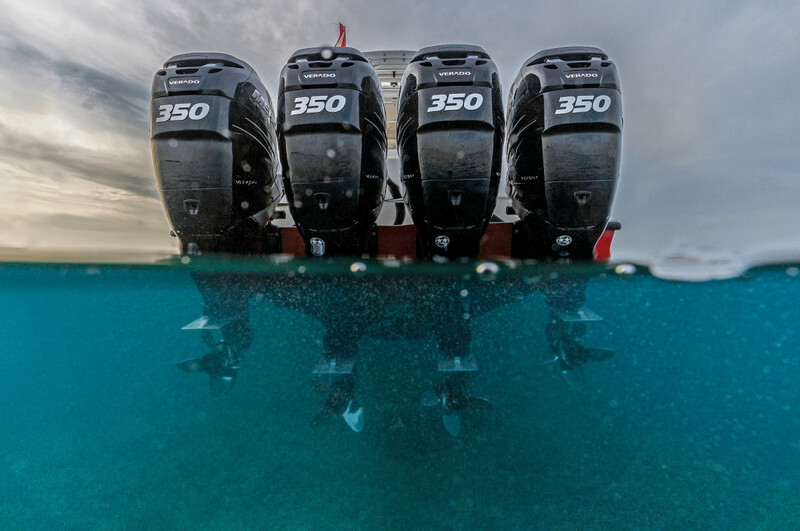 Evinrude has revived interest in 2-stroke outboards with its E-TEC G2 series and Suzuki recently released its largest outboard to date, a 350-hp V6 with counter-rotating propellers. Although the new models from Tiara and MJM generate a lot of buzz because they’re big boats, the number of smaller outboard-powered dayboats is growing, as well. 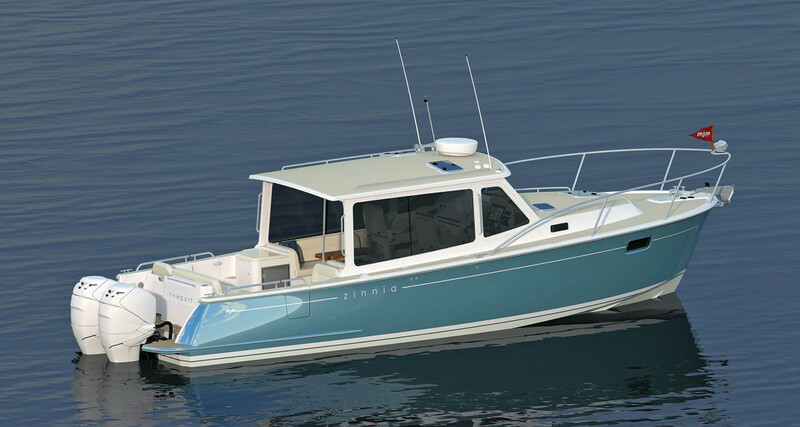 Four Winns’ HD series consists of single-engine 22-, 24- and 27-foot models, each powered by a single outboard. 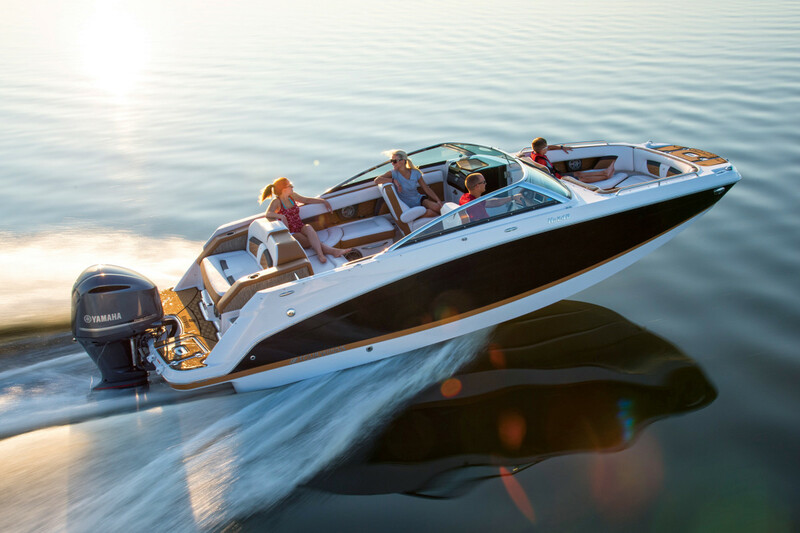 Chaparral has a three-model series in its Suncoast line of deckboats, again powered by a single outboard. “People are no longer worried about taking a single outboard offshore or out for a day on the lake,” says Meeler. Regal offers two models with a single outboard and three with twin outboards. Even legendary offshore powerboat manufacturer Cigarette Racing Team is selling more outboard-powered center consoles than traditional sterndrive go-fast-style boats. And no matter which manufacturer you ask, the appeal of outboard power is that it enhances a boat’s versatility. Unlike inboards, outboards can be trimmed, which improves performance and lets a boat venture into more shallow areas, opening up a greater variety of waterways. Although sterndrives and pods can be trimmed, they cannot be raised out of the water when they’re not in use, which causes corrosion concerns for boats used in salt water. Compared with all three other propulsion systems that basically have an engine in the boat, using multiple outboards makes the boat faster because of a beneficial power-to-weight ratio and, in most cases, the outboards are more fuel-efficient. With a single outboard, the Four Winns HD 240 OB has solid performance and plenty of space for passengers. It would appear that the magic number for the new breed of outboard-powered dayboats is 50 mph. Tiara expects the 37 LS to hit the half-century mark and MJM is looking for more than 50 with twin 350-hp Mercury Verados on the 35z. The single-engine Four Winns HD 240 runs just under 50 mph with a single 300-hp outboard. With quad Mercury Racing Verado 400R outboards clamped to its stern and a twin-stepped bottom design, Formula’s 430 SSC, which we covered last month, has a top speed of 64 mph. 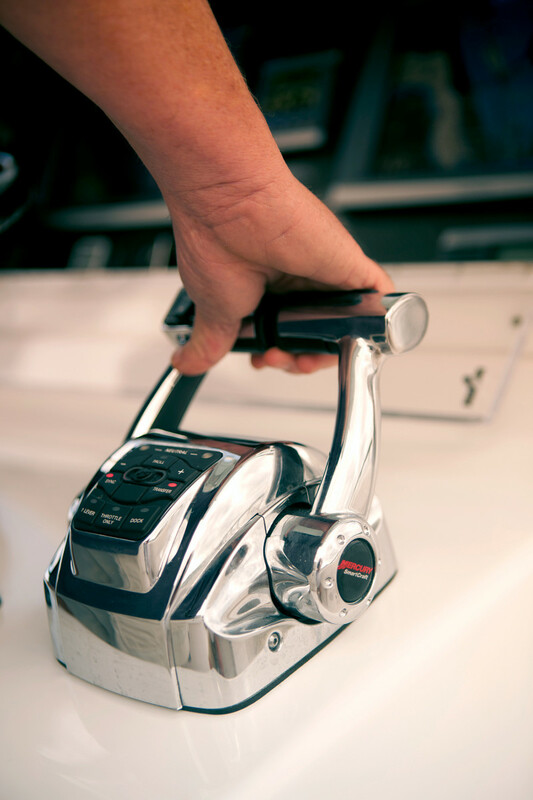 In addition to improved power and overall performance, the other key to the increasing popularity in today’s big outboards is all of the features that come with them, including joystick steering, station keeping, autopilot and, in some cases, automatic trim. MJM went with the Mercury Verado series because Johnstone and other company representatives were impressed with how Mercury’s Joystick Piloting for Outboards and its Skyhook station keeping system worked. Yamaha’s Helm Master is an integrated system that controls everything from the ignition back to the motor. Evinrude introduced its iDock joystick system a couple of years ago and has recently unveiled an upgraded version. The fact that most manufacturers provide a selection of colors for outboards only adds to their appeal. Evinrude leads the way in freedom of choice, with a number of colors for its side panels and accent stripe colors, as well. Theoretically an owner could replace one of a boat’s four outboards every year and would always have at least three under warranty, depending on the terms of the warranty. As the boats get bigger, Caruana explained that it’s not the beam of boats that could cause a concern as much as the depth, or the height of the transom. Mercury’s longest shaft is 30 inches, and the same goes for the Yamaha F350. Latham Marine makes a conversion kit that extends the shaft length to 35 inches, but it could void an engine’s warranty. One thing that all of the manufacturers seemed to agree on is that the consumer is no longer shy about hanging multiple outboards on a transom. “Buyers have told us, ‘If I can put one more on and it doesn’t affect the handling, I’m going to do it,’ ” says Caruana. That’s not something you would have expected to hear a few years ago. In 2004, when Mercury introduced its Verado series of outboards, the engines came with digital throttle and shift, and Randy Caruana, vice president North Central America and Asia Pacific, says the industry wasn’t quite ready for it. “There was pushback against digital throttle and shift initially,” he says. But it didn’t take long for customers to catch on because they weren’t looking at the prospect of driving a boat with three or four shift and throttle levers and all those instruments. Mercury Verados had what was called “Shadow Mode.” Even with four engines on a boat, Shadow Mode allows the operator to control all of them with two shift or throttle levers. In 2010 Yamaha introduced the V MAX SHO, convinced that the combination of all that power and reduced weight would be all the rage in the bass boat community. It was. What Yamaha officials did not expect was the number of pontoon-boat owners who also wanted the high-performance offering. “You had all the aspects that mom wanted and the power and good looks that dad wanted and a great big platform with 800 watts that the kids wanted,” Yamaha product planning and information manager David Meeler says when discussing pontoon boats. He estimates that about 25 percent of the production of V MAX SHO motors went to pontoon-boat companies. Today Yamaha’s High Thrust series of 9.9-, 25-, 50- and 60-hp outboards are designed to push heavier models, such as pontoons and sailboats.